Choose Edit Scheme from the Scheme pop-up menu in the project window toolbar to open the scheme editor. Select Run from the list on the left side of the scheme editor. 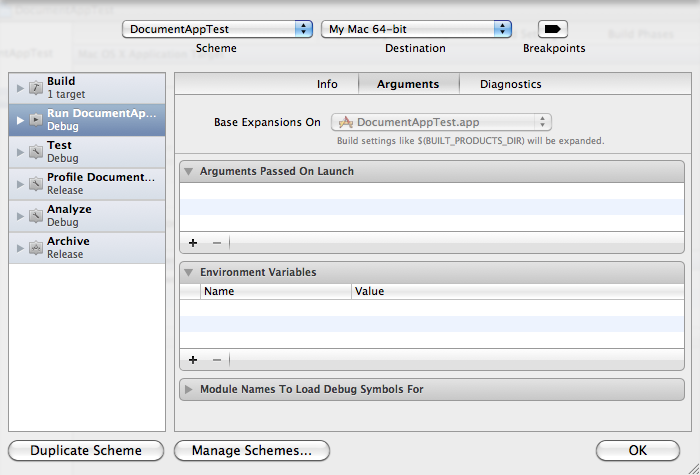 Click the Arguments button in the scheme editor. From here you can add command-line arguments and environment variables. Clicking the Diagnostics button provides checkboxes for commonly-used environment variables. I had been searching the web to find out how you can you use pipes/ioredirection with Xcode 4.
and it would run as it should. so i tried to add in the arguments in Xcode, but it doesn't have the same effect. Is there a way to do this on Xcode 3.2.6? I’d prefer not to have to switch to Lion just to be able to pass command-line arguments to my program from Xcode. To set command line arguments in earlier versions of Xcode, select your Executable from the Groups and Files list. Click the Info button in the toolbar (or right-click and choose Get Info) to open the executable inspector. Click the Arguments tab in the executable inspector. From there you can set command line arguments and environment variables.